Ledded Lights Ltd. provides a new lighted sign to display the hymns and psalms in a church's daily order of service. It features a simple one-button interface to set the hymn and psalm numbers, and remembers the settings while the display is turned off between services. More details are on the catalog page. Contact Lorita Law (loritalaw@gmail.com) for further information and prices. This is the lightning talk I gave at the SoOnCon conference hosted by Diyode, the way I imagine myself giving it. "Django is a high-level Python Web framework..." that strikes me as being a supremely useful tool to have, now that I've studied a bit. My second cut at a demo application led me to try parts-explosion, requiring recursive many-to-many relationships. The Django docs describe all the pieces you need to do this; how they fit together to retrofit parts explosion into a parts database is described in this note. Some circuits and scripts made while getting started in JTAG debugging. pyLogicSniffer  a SUMP logic-analyzer client to display captures from the Open-Bench Logic Sniffer. Uses wxPython, pySerial and NumPy. The code and even the repository itself are still very much under construction. The latest code is available via git clone https://github.com/melwilson/pyLogicSniffer.git. The recent beta 0.1.1 release is available as a .zip file. Older versions are also available for download. footprinter.py  Yet another program to generate PCB part footprints for the gEDA electronic design application. This one is implemented as a Python module. Since the footprint is actually created by a small Python program (which imports footprinter,) you can use the full power of Python data structures and control structures to make the footprint-creating task easier. This recent version of footprinter makes some incompatible changes from the previous one. The format of the .fp files that are produced has not changed; only the class constructors used in the Python programs. A few sample footprint source files are also included. Download version 0.1 for the latest, or if you need to keep compatibility with .py files you've already (!) made, download the older 0.0 source. footprinter.py by Mel Wilson <mwilson@melwilsonsoftware.ca> is licensed under a Creative Commons Attribution 3.0 Unported License. SysvIpcMsg  access to the SYSV IPC message-passing functions for Python programs. This package provides a thin wrapper around the msgget, msgsnd and msgrcv (and a few other) functions, callable from a Python program. iso5mm.ps creates Isometric graph paper on a 5mm grid. Useful for hand-drawing visualizations of 3-D parts. PCBDA-990000.ps prints a double-size template for Creatron's PCBDA-990000. PCBDA-990001.ps does a template for Creatron's PCBDA-990001. arduino-protoshield.ps does a template for an Arduino Protoshield. whitenoise-panel.ps lays out a panel (shown at right) for a little piece of audio gear. 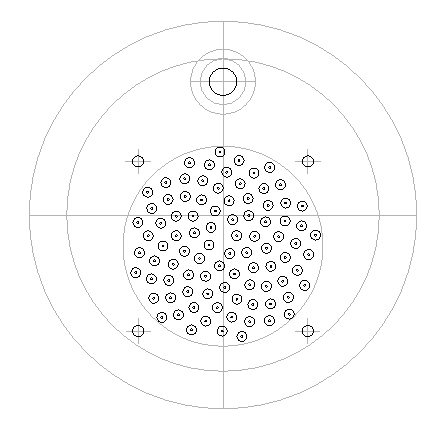 The holes in the speaker grille are in the "sunflower seed" fibonacci spiral pattern modeled by H.Vogel, and the pattern can be calculated right in PostScript.